Margaret Gardiner first visited Orkney in the 1950s and later converted the old quayside building to house her collection of modern paintings and sculpture. Born into a well-to-do family, Gardiner studied at Cambridge University before a brief spell as a teacher. She was an early activist against the fascist movement in the 1930s and in the 1960s organised an international press campaign of public figures against the Vietnam War. The author of several books including a biography of Barbara Hepworth she was also associated with some of the major figures in 20th century literature including Louis MacNeice and W. H. Auden. Throughout the 1930s and 40s Gardiner was a key supporter of the small group of artists who sought sanctuary in St Ives and she was also an early champion of the Cornish painter and seaman Alfred Wallis. 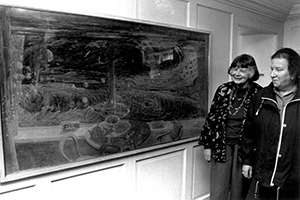 Following the Second World War she encountered and encouraged a new generation of artists, including Peter Lanyon, Patrick Heron, Terry Frost, Margaret Mellis, John Wells and Roger Hilton, who had been drawn to St Ives by its growing reputation as a centre of innovation. Although never happy to be called a collector - "I hate being called a collector, for I never set out to collect" - Gardiner gathered together, through friendship and astute patronage, a very personal and important collection of art that closely charts the development of British Modernism. Gardiner's interest in art was deeply influenced by her long friendship with Barbara Hepworth and through this friendship she came into contact with many of the principal figures in 20th century British art, including Hepworth's second husband, Ben Nicholson. 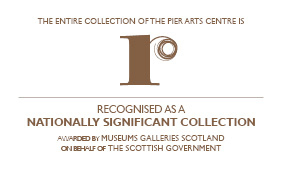 Gardiner donated the collection to ‘be held in trust for Orkney’ in 1979, and The Pier Arts Centre Trust was established. The Collection has grown steadily since 1979 and now contains over 180 works.